Yesterday we went somewhere and Archie and I didn’t know what or where it was. It wasn’t shopping, it wasn’t the hospital, it wasn’t the woods and it wasn’t the beach but it was very good. There were some bad bits like these big engines that made a lot of noise which I didn’t like. 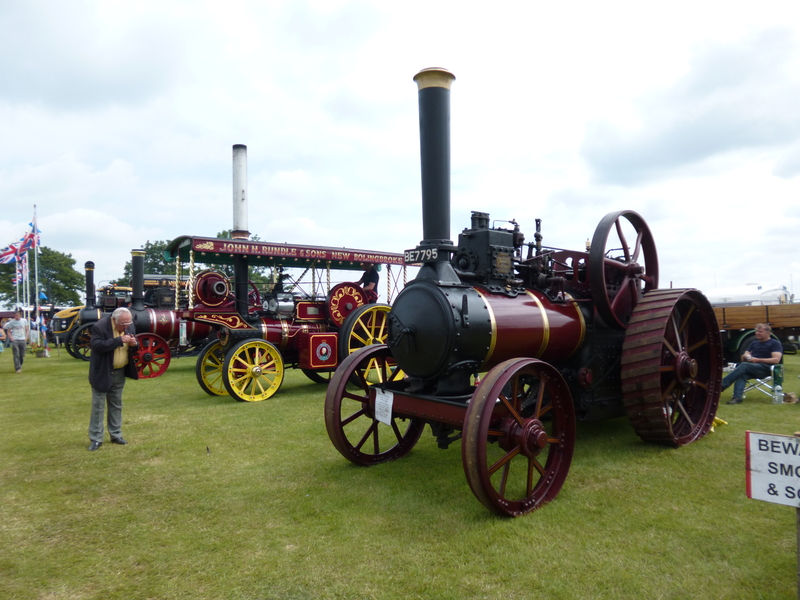 Mark said “Lark doesn’t like the steam engines” and he was right.They smelt horrible, too. There were lots of people and some were riding on horses and jumping which was good but we weren’t allowed to join in. Mum gave me a Bonio and I pretended I didn’t want it until she went to put it away and then I ate it all up. A lady offered me some water but other dogs had been drinking from it and I thought that was a bit yucky. She said someone nearly wee’d in it but she’d stopped them but I’m not sure she was right because it smelt funny and I think someone had wee’d in it without her seeing. Lots of people came up to us and said we were lovely but mostly they liked Archie because he is so big so I pushed my nose in to make sure I got stroked, too, otherwise it’s not fair. 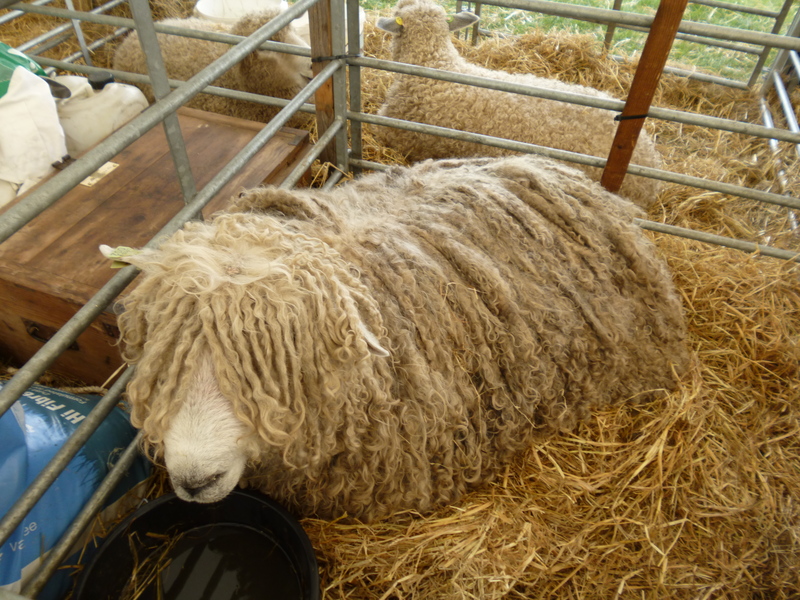 Mum took us to see some sheep and some pigs and when we came out of the tent she saw a sign that said “No dogs allowed” but we were very good and didn’t bark or anything and Mum just said “Oh dear”. 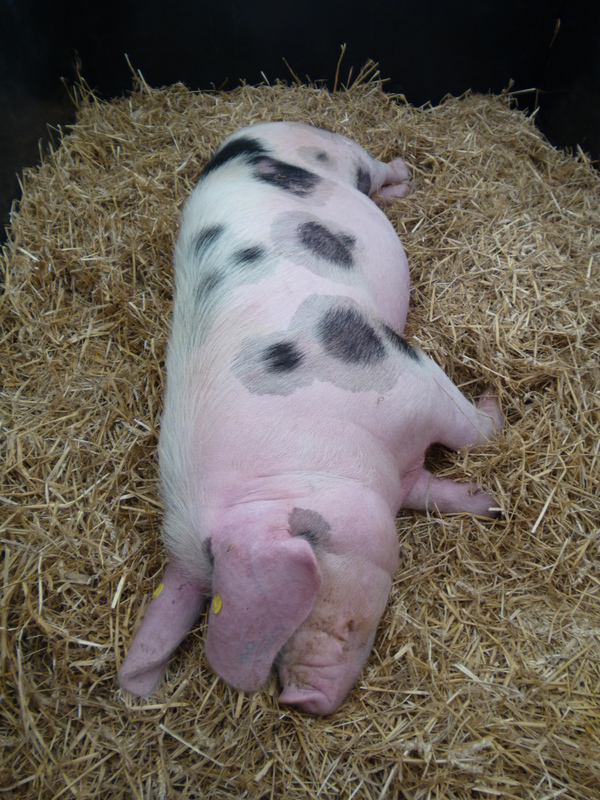 The pigs were enormous but Archie didn’t like them much and tried to pull Mum out of the tent. Mum did some shopping and bought some food but no dog food. There was a lady giving away dog food but we didn’t like it and neither did any of the other dogs that we saw. There were some men in red coats sitting on horses and they had hundreds of dogs with them. The man on the horse said “Wait!” and all the dogs stopped and waited and then he said “Come on!” and they all moved on. Mum said the dogs used to chase foxes but that they aren’t allowed to now which she thinks is a good thing. Archie thinks he would like to chase a fox but just on his own, not with a lot of other dogs. I think foxes are a bit scary. All the dogs stopped to have a wee on the same bit of fencing, one after the other. Mum says I am obsessed by wee but Mark never goes past a toilet without going into it so I don’t see I’m any worse. Mark says Mum is obsessed by wee at the moment, though. I didn’t like to have a wee with all those people around so I waited until we got out of the gates and were on our way to the car and then I had the biggest wee in the world; so did Archie. I am still trying hard with this thing Mum calls ‘house training’ which means not weeing in the kitchen or utility room. Sometimes I think I want to go but then it’s raining and I don’t want to get wet so Mum puts me in my crate for a little while. I don’t mind if she’s in the room but if she’s not I like to sing to myself. I sing the Song of my People. It is a very beautiful song, very long and with many notes. Mum likes it a lot because when I sing she always comes back and says “What are you doing, Lark?” I think she would like me to teach it to her so maybe one day I will. Another strange thing happened to me this week. Mum said “Oh, Lark, I think you’re in season”. I don’t know what that means but I do know it means she put some pants on me which I didn’t like very much. They are a bit papery and I love tearing paper so even though they have pictures of fish on them which I like, I had to tear at the paper and then they came off. Mum just got some sellotape, though, and taped me into them. And then a magic thing happened! I went into the garden to have a poo and when I finished it wasn’t there! Later on when Mark took my pants off, the poo had magically appeared in my pants! It was so strange and I still can’t work it out. Mum says I’m not to talk to any boy dogs except Archie which is OK by me as I’m a bit shy. 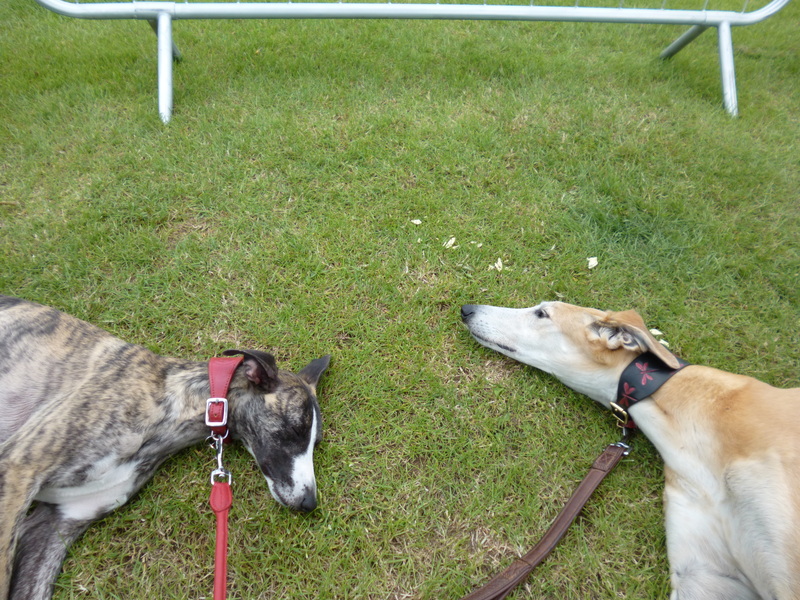 Here is a picture of me and Archie at the steam engine animal dog/pig/sheep place. 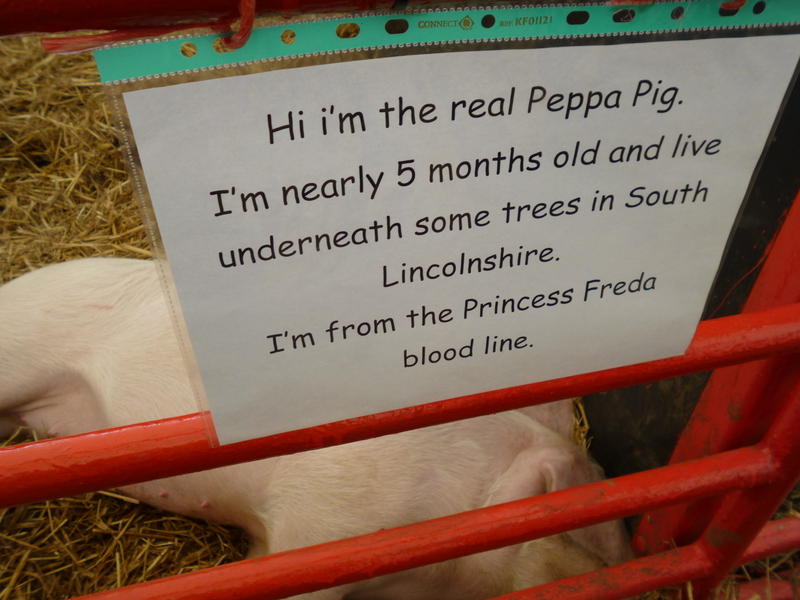 We met the real Peppa Pig but she was asleep so we didn’t get to talk to her. She looked very nice, though. This week we have been doing lots of running around and chasing things. Archie still keeps putting my head in his mouth and when Mum strokes me, she says “You’re soaking” because he drools on me and makes my head wet. I don’t think he wants to eat me, though. He likes biting my knees, too, but they are tickly and make me kick him. We went to Gibraltar Point and I saw 6 bees, 4 butterflies and hundreds of ants. There were some really good smells but we had to stay on our leads in case we ate the baby birds and that wasn’t so much fun. When we got back to the car, Archie and I pretended we didn’t want water until Mum had thrown it away and then we started panting so she had to pour out some more and then we drank it. She thought it was a great joke. The exercise man came to see Mum again. Why she doesn’t just run around the garden and chase balls, I don’t know, but he is trying to help her keep moving. He gave her this thing that counts her steps so she can tell how much running around she does every day. I don’t know if the man knows but Mum doesn’t run anywhere so I don’t know if she’s cheating or not. I thought of a brilliant idea to help her. Every time she takes her shoes or slippers off, I take them quietly away and hide them all over the house and garden. Then when she gets up, she has to look for them so that makes her move more. I found a really good hiding place for one of her slippers, right underneath a bush in the garden but my Mum is so clever, she found it. She was very pleased because she said “Lark, you are a little so-and-so” which I think means she can’t think of enough good words to describe me. Our garden is full of good stuff you can pick up and run around with. There is a pile of dead weeds, a wood pile, pegs and some stones but I found the bestest thing of all. It was black and like a big stone but it was very light so I could run around with it. Mum said “What have you got there, Lark?” as she is always impressed by what I find. She said it was charcoal and it’s the most brilliant thing. It makes my teeth black and I can get it on my forehead if I try. It tastes odd but I like it. I have sneaked it into the house and put in my bed upstairs. It is one of my treasures. I am also becoming a bit of an artist. There are lots of nice things in the house and garden but some need a bit of an artist’s touch so I have decided to help Mum by giving them what I call ‘the Lark Touch’. Mostly done with my teeth, I have single-handedly made the garden hose reel a bit more modern with a twisted look to the casing and have removed the central part of the handle. It looks so much better and I am sure Mum will be very pleased when she sees it. I really am her little so-and-so. This week is full on, as the Aussies say. We go to Lincoln to see what the new oncologist might be like and find that he seems calm, knowledgeable, straightforward and prepared to answer questions. This sounds good. One of my complaints is that I have not received a single result of ANY tests I have had done with Virgil since I started seeing him. This includes blood tests, tumour markers, Echocardiogram and CT scan. I have asked at the GP surgery, asked Virgil’s own secretary and also the chemotherapy nurses but they have just drawn a blank. He probably has the reports but hasn’t looked at them yet so no-one else can give me any information. This is thoughtless to say the very least. We agree between us that Dr Chaudhuri will take us on and that we will travel to Lincoln for treatment and to see him every 3 weeks. While I am drawing a deep breath of relief, he goes to see if he can see the results of any of my tests. Swappping to a new oncologist means new dates to see him and different treatment dates and they happen to fall right when I am going to the Penny Brohn Centre with Ms Marsden and Mrs Ure. It would mean I would get an evening and half a day before having to be picked up and brought back home again. I really love going to Penny Brohn but think this might actually be more stressful that just going along with the new dates. Just as we are musing on this, we are asked to go through to see the CT scan. He tells me there is a spot on my liver which is suspicious and I tell him this has come up over the last 2 years which he is pleased about because he didn’t think it warranted further investigation so he will look at the Charing Cross notes. He then whizzes around the chest area and there doesn’t appear to be much there. He says there are just a couple of small spots but that’s it. I ask about the 1cm lesion at the base of my right lung. “No,” he says, “there is barely anything there. I can hardly see it”. I begin to cry with shock and he says “This is good news!” which I knew but was finding it hard to take in. Apparently there are just a couple of small spots throughout both my lungs. My pleural effusion is resolving itself by thickening the lung wall in that place so there is very little fluid there not. All good news. We have found an apparently good oncologist AND had the best news we have had since I was diagnosed all in one day. I decide to ditch the morphine for one night and indulge in a glass of champagne which tastes wonderful. Apart from the offspring, we keep the information to ourselves for a couple of days. It is given moderately to Mr Mason’s parents in case they think I am cured. I don’t feel like shouting it from the rooftops. I feel it has given me probably another year or so which is wonderful but I am cautious in my optimism. It’s good news but that’s all it is for now, and I feel a lucky girl. On Wednesday I have a really nice woman from Sheffield University come to talk to me about my blog and how I communicate my feelings about terminal illness. We have a really good chat about it which I enjoy immensely. I tell her she’s come on a good week and confide my good news to her which makes her cry. Always a good sign in a researcher, I think. She recorded our whole interview so some poor person has to transcribe it and then it will be analysed in the same way as the blog. She confessed she is reading the whole blog and sometimes laughing out loud at her desk when her fellow researchers might be reading something drier. It’s ultimately about communicating difficult news, I think, although I hope she will correct me if I’m wrong when she gets to this page. The frustration is that I am trying to have separate pages on this blog. One for pictures of the house, one for Lark’s diary (she is a precocious little thing except in the matter of house training) etc and it’s not really working out. I checked out a few bits of information on different sites which all say it’s so EASY but they lie. If this blog appears odd or unusual, it’s because I am so tired i am actually falling asleep over it which is not good. So, this one is launched with no checking, no nothing. It appears red in tooth and claw. It’s hard to write when you can’t actually see the words properly as they keep moving all over the place. I still hope you enjoy it. On Friday, Jan the cleaning lady comes and pushes the noisy vaccuum cleaner around but she also spends time rubbing my head which I like. Mum wasn’t feeling well so sat in her tippy-up chair under the apple tree with a blanket around her. She said she had done too much the day before. I sat under her chair and kept pushing her bottom when she wasn’t expecting it. Archie and I are trying to perfect our game of bitey-face and he doesn’t growl so much which is better as that scares me a bit. It’s quite easy to lose him in the garden as I can jump into a bush and he won’t see me if I lie still. Mum took a film of us playing and although I squealed a bit, I liked it really. Today it is raining and Mum took me outside for 10 minutes in the rain to have a wee but it wasn’t nice out there so I waited until I got inside and before she had hung up my coat and lead, I had done a lovely big wee in the utility room. I don’t know what all the fuss is about. Everyone else (except Archie and the cats) goes to the toilet indoors. Perhaps I should start a campaign. Anyway, I am now in what Mum calls “The Dog House” and am sitting in the basket under her desk while she writes. Life is so confusing. Mum also says if this post doesn’t appear in the Lark’s Diary page she is going to give up. Give up what I am not sure.